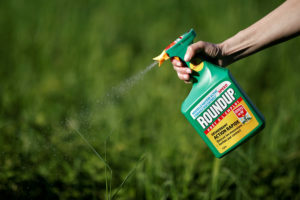 SAN FRANCISCO — Roundup weed killer was a substantial factor in a California man’s cancer, a jury determined Tuesday in the first phase of a trial that attorneys said could help determine the fate of hundreds of similar lawsuits. The unanimous verdict by the six-person jury in federal court in San Francisco came in a lawsuit filed against Roundup’s manufacturer, agribusiness giant Monsanto. Edwin Hardeman, 70, was the second plaintiff to go to trial out of thousands around the country who claim the weed killer causes cancer. Monsanto says studies have established that Roundup’s active ingredient, glyphosate, is safe. The outcome of such cases can help attorneys decide whether to keep fighting similar lawsuits or settle them. A San Francisco jury in August awarded another man $289 million after determining Roundup caused his non-Hodgkin’s lymphoma. A judge later slashed the award to $78 million, and Monsanto has appealed. The outcome of such cases can help attorneys decide whether to keep fighting similar lawsuits or settle them. Legal experts said a jury verdict in favor of Hardeman and the other test plaintiffs would give their attorneys a strong bargaining position in any settlement talks for the remaining cases before Chhabria. The judge had split Hardeman’s trial into two phases. Hardeman’s attorneys first had to convince jurors that using Roundup was a significant factor in his cancer before they could make arguments for damages. The trial will now proceed to the second phase to determine whether the company is liable and if so, for how much. Hardeman declined to comment outside court. Many government regulators have rejected a link between cancer and glyphosate. Monsanto has vehemently denied such a connection, saying hundreds of studies have established that the chemical is safe. “We are confident the evidence in phase two will show that Monsanto’s conduct has been appropriate and the company should not be liable for Mr. Hardeman’s cancer,” it said. Monsanto developed glyphosate in the 1970s, and the weed killer is now sold in more than 160 countries and widely used in the U.S. The herbicide came under increasing scrutiny after the France-based International Agency for Research on Cancer, which is part of the World Health Organization, classified it as a “probable human carcinogen” in 2015. Lawsuits against Monsanto followed. The company has attacked the international research agency’s opinion as an outlier. The U.S. Environmental Protection Agency says glyphosate is safe for people when used in accordance with label directions. Hardeman started using Roundup products to treat poison oak, overgrowth and weeds on his Sonoma County property in the 1980s and continued using them through 2012, according to his attorneys. He was diagnosed with non-Hodgkin’s lymphoma in 2015.